Kansas Department for Children and Families Secretary Phyllis Gilmore, left, listens as Gov. 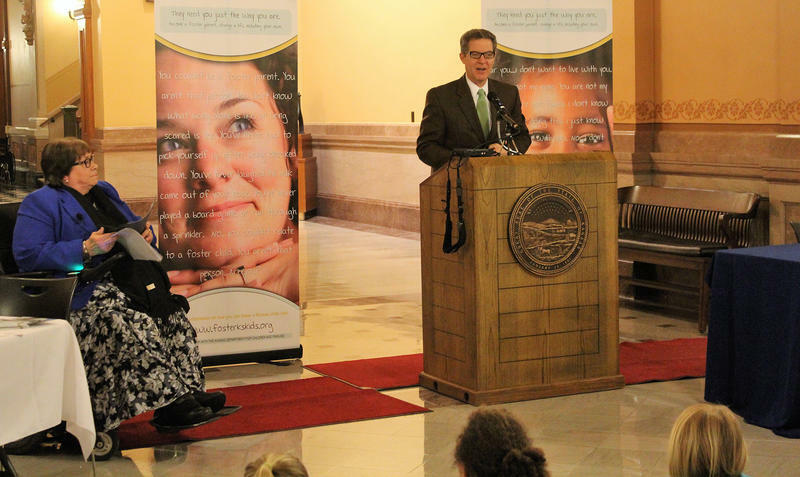 Sam Brownback speaks about the need for more foster parents during an event Wednesday at the Statehouse. A bill to increase oversight of the Kansas foster care system hit a snag after state officials said its wording could jeopardize millions in federal funding. 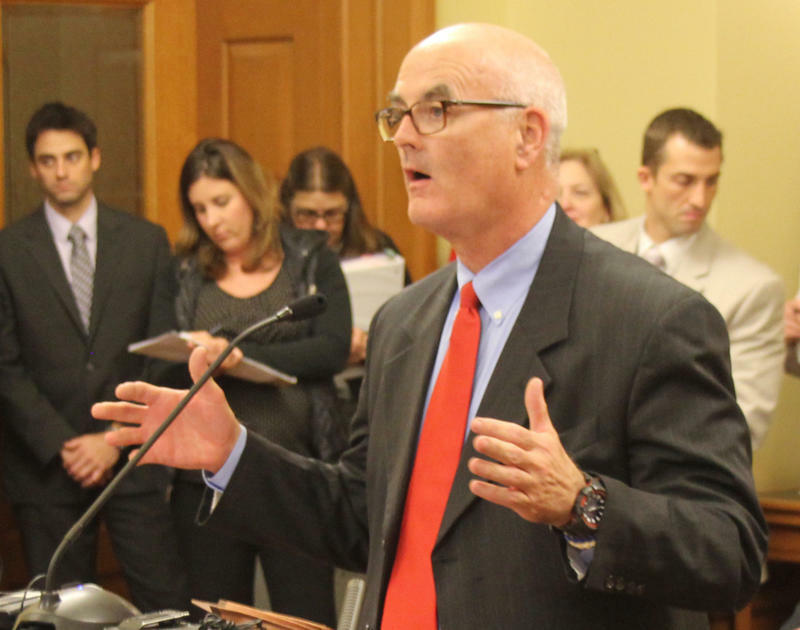 The bill would create an interim oversight committee that would study problems in the state’s foster care system and submit a corrective action plan to the Kansas Legislature. The House Committee on Children and Seniors approved the bill in March, but it still must pass the full House and Senate. But the Kansas Department for Children and Families, which oversees the foster care system, said following that plan could cost the state $48 million in federal funding — nearly a third of DCF’s annual budget. The U.S. Department of Health and Human Services reviews state foster care programs about every three years and requires them to make changes outlined in a performance improvement plan. DCF Secretary Phyllis Gilmore said the state could lose federal funding if anything in the oversight committee’s corrective action plan contradicts the federal performance improvement plan. “Corrective action plans are by design not suggestive, but directive,” she said in a statement emailed Wednesday. Rep. Jarrod Ousley, a Merriam Democrat and one of the bill’s more vocal supporters, said DCF’s concern is misplaced. The interim oversight committee couldn’t make law, so lawmakers and the governor would have to approve any plan before DCF would implement it, he said. “It would have to have open hearings, it would have to have conferees,” he said. On Thursday the House Committee on Children and Seniors will consider changing the bill’s wording to address DCF’s concerns about lost federal funding. DCF representatives previously raised concerns that a legislative oversight committee would duplicate existing work and strain the department’s staff time. But Ousley and other supporters said they think the foster care system needs a plan to improve outcomes for children. “It’s important work, and it’s past time for improvements to be made,” he said. Since 2014, a record number of Kansas children have entered the foster care system. At the end of February, nearly 7,000 children were in the state’s custody. Meg Wingerter is a reporter for the Kansas News Service, a collaboration of KCUR, Kansas Public Radio and KMUW covering health, education and politics. You can reach her on Twitter @MegWingerter. Kansas News Service stories and photos may be republished at no cost with proper attribution and a link back to kcur.org. Kansas has plenty of reports on problems in its foster care system but needs a plan to fix them, according to members of a House committee. The House Children and Seniors Committee voted Tuesday to create a foster care task force that will present a plan for improvements to the foster care system by January. 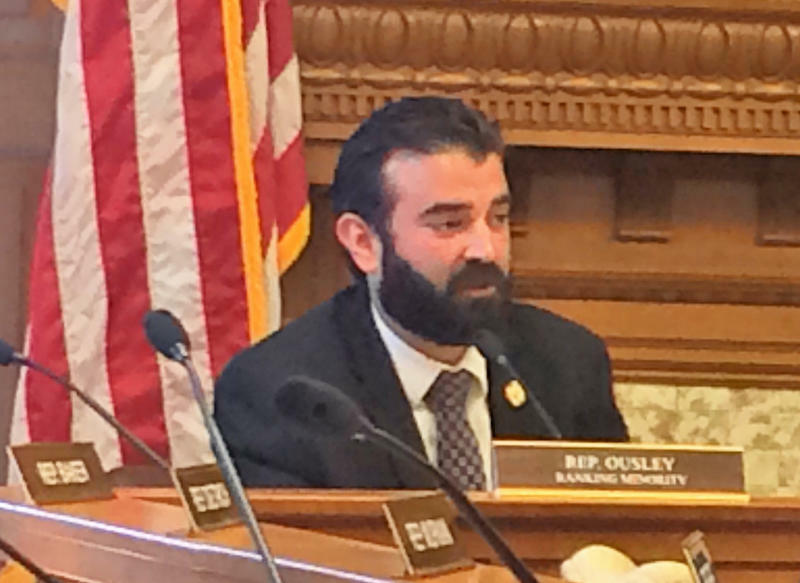 Rep. Jarrod Ousley, a Merriam Democrat, said the state needs to do more than study the foster care system. “This task force is not for oversight. It’s for corrective action,” he said. 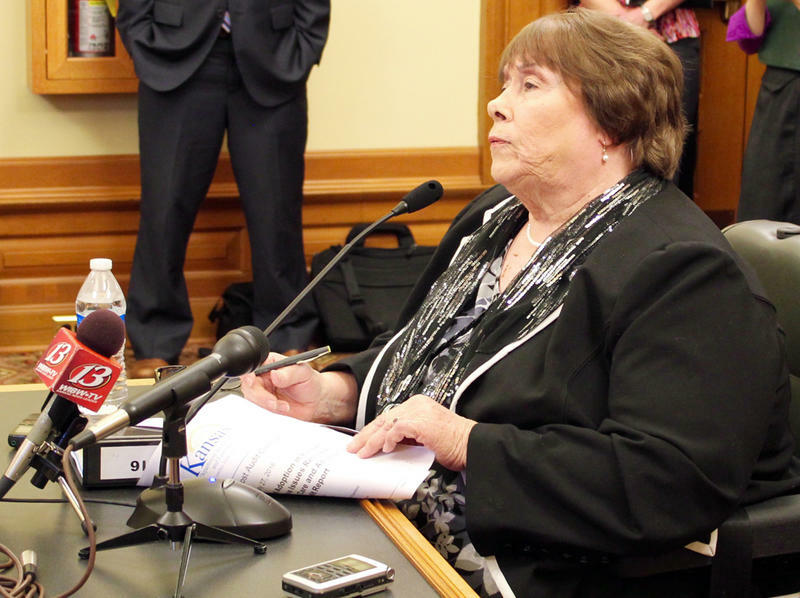 Kansas Department for Children and Families Secretary Phyllis Gilmore brushed off two Democrats’ calls for her resignation and defended her agency Wednesday following an audit critical of its oversight of the state’s foster care system. Gilmore acknowledged that the audit was “negative,” but disputed some of it and said the agency already had started correcting most of the deficiencies cited. Members of the Legislative Post Audit Committee again declined Tuesday to request an investigation into whether the Kansas Department for Children and Families has placed children in risky situations because of a preference for heterosexual foster parents. Rep. Jim Ward, a Democrat from Wichita, first requested the audit in December after reports surfaced of DCF removing a baby from the home of a lesbian couple in Wichita and placing it with a heterosexual Topeka couple who subsequently were charged with child abuse. 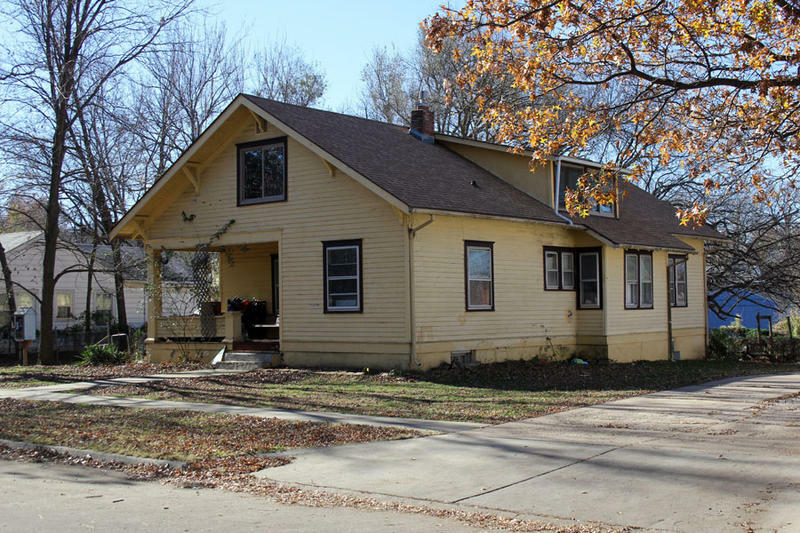 The arrest of a Topeka couple on child abuse charges has raised new questions about a custody battle that some say illustrates a pattern of discrimination against gay Kansans seeking to adopt children. The 2014 custody case pitted a lesbian couple from Wichita, Lisa and Tesa Hines, against Jonathan and Allison Schumm of Topeka for custody of the Hineses’ foster child, Isabella, who had been in their care since she was 5 days old.